US Secy of State John Kerry met Monday with PA Prime Minister Salam Fayyad in Jerusalem ahead of ongoing talks with Israeli officials. U.S. Secretary of State John Kerry met Monday with Palestinian Authority Prime Minister Salam Fayyad in Jerusalem ahead of ongoing talks with Israeli officials. “I believe if we can address the security needs of Israel, and they are real, and if we can [meet the] state aspirations of Palestinian people, and they are real, I believe that if we can get on a track where people are working in good faith to address the bottom line concerns, it is possible to be able to make progress and to make peace,” Kerry said prior to the meeting, held at the U.S. Consulate. 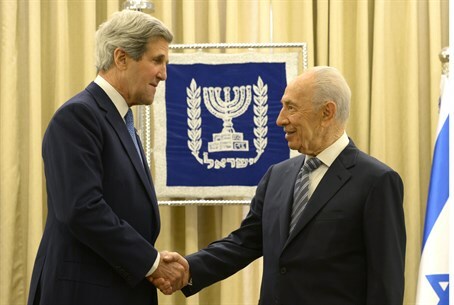 The secretary of state was scheduled to meet directly afterwards with Israel’s President Shimon Peres, then have dinner with Prime Minister Binyamin Netanyahu, AFP reported. Kerry is scheduled to meet once again with Netanyahu for further talks on Tuesday morning, as a follow-up to discussions he had in Ramallah on Sunday with PA Chairman Mahmoud Abbas. An Abbas spokesman told AFP the PA leader said the release of prisoners held by Israel is a “top priority “ for resumption of peace talks. Over the past few weeks, Abbas has reiterated old demands for preconditions to resume final status talks. One is that Israel must commit to a freeze on all construction in Judea, Samaria and parts of Jerusalem restored to Israel in 1967 before the PA will resume final status talks. Another involves a commitment to setting borders before they are negotiated. “Any return to negotiations requires Netanyahu to agree on 1967 borders,” Abbas political adviser Nimr Hammad told AFP last week. Israel has categorically refused to commit itself to preconditions to enter negotiations, as before. Moreover, Israel’s prime minister has said he will not accept a return to the 1949 Armistice Lines, which were always meant to be temporary – those which are referred to by the PA as the “1967 borders” – and which are a certain security risk for the Jewish State. Abbas has now added a new demand, requiring Israel to present a map of the borders of a future PA state before talks can resume. A high-ranking Israeli government official told the Hebrew-language daily Ma’ariv that such a demand is out of the question. “It would be insane to present such a map,” said the source. “In effect, this means giving up our most important asset, without the Palestinians having committed themselves to anything – neither recognition of Israel as a Jewish state, nor security arrangements,” he said. The secretary of state has made it clear that he is hoping Turkey will have a role to play in negotiations between Israel and the Palestinian Authority, but Justice Minister and lsraeli lead negotiator Tzipi Livni is not enthusiastic about the plan. Turkish Prime Minister Recep Tayyip Erdogan has yet to agree to return his country’s ambassador to Israel, and to accept Israel’s ambassador back in Ankara, even after receiving the apology he demanded from Prime Minister Netanyahu over the 2010 Mavi Marmara incident. Israel’s agreement to compensate the families of those killed during the incident has just been rebuffed to further a political agenda against Israel’s maritime blockade against terrorists who smuggle arms into Gaza to attack southern Israel. The incident – which has led to a three-year rift in ties – occurred when Israeli soldiers were attacked by armed men aboard the Turkish-owned vessel that participated in the illegal flotilla that attempted to break that blockade. Although Kerry has done what he could to get the diplomatic process between the two countries back on track, two weeks after Netanyahu’s apology, Turkey has yet to decide it is willing to forgive, let alone forget.